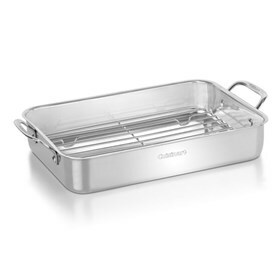 The Cuisinart 7117-14RR lasagna pan features mirror-polished stainless steel interior which does not react to acidic foods or alter natural flavors. The pan has riveted and comfort-grip stainless side handles which allows it placing into the oven and lifting from oven easy and safe. This pan fits in all standard ovens and is ideal for lasagna, casseroles and au gratin potatoes. The 14 Lasagna Pan W/ Stainless Roasting Rack Chef Classic has many exciting features for users of all types. See the 14 Lasagna Pan W/ Stainless Roasting Rack Chef Classic gallery images above for more product views. The 14 Lasagna Pan W/ Stainless Roasting Rack Chef Classic is sold as a Brand New Unopened Item.